When is the right time to start vegetable seeds indoors? It is a question we get often to the blog this time of year. And a very good one at that! Starting seeds at the wrong time can both cause major problems for plants. When started too early in the growing season, seedlings can quickly become too large for their cells. Way before they are ready for transplanting! A young seedling emerges through the soil. And this can lead to a whole slew of issues before the young seedlings ever make it outdoors. For starters, the roots of overgrown seedlings become tangled and matted. This can make it hard to keep them hydrated as plants struggle to absorb water. It also makes it difficult for the plants to soak up needed nutrients from the potting soil. Have you ever watered a flat of seedlings only to watch the water simply pour through? Seedlings that get too large can become root bound. It is almost always a symptom of overgrown roots below the soil. On the flip side, starting plants too close to planting time can cause big issues for plants as well. Seedlings that haven’t had enough time to prepare for life outdoors can be in big danger at planting time. Immature seedlings are easily damaged by cool evening temperatures or a light frost. They also easily fall prey to hard rains and winds. 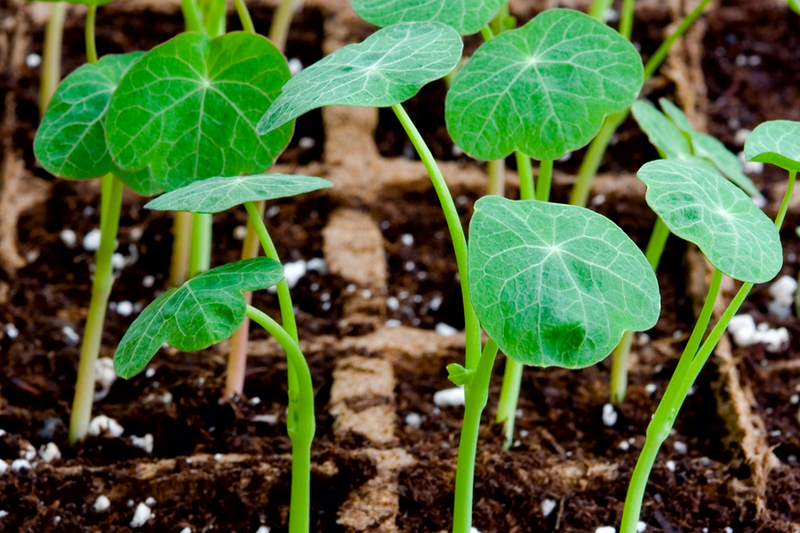 So, just when is the best time to start vegetable seedlings? Selecting the right time to start seeds indoors is a big key to vegetable gardening success. For starters, it all begins with knowing your frost date. And from there, its all about using a simple count-back method. A frost date is the average date of the last light freeze that most likely will occur in your area each spring. Frost dates are published by a variety of resources and are quite easy to find. In addition, most seed companies have them posted on-line as well. Local extension offices are a great resource too. Healthy seedlings growing strong and true. Once you know your frost date, you can employ a simple system called the count-back method. It is an easy way to have your plants perfectly ready when it comes time to plant. Begin by checking the back of your seed packets for recommended seed starting times. Most seed packets list 4 to 6 weeks as a general rule of thumb. Always take the longer side of the recommendation to be safe. Now, add on one more extra week to the longest time recommended. This gives plants a little extra time to harden off in the last week or two before planting. This young seedling is far from ready for the great outdoors. Next, to know exactly when to plant seeds, simply count back from your frost date. As an example, lets say we will be starting tomato seeds with a recommended time of 4 to 6 weeks on the seed packet. And for the example, we will use June 1st as the frost date. Using the count back method, we start by picking the longer time. In this case, it would be 6 weeks. These tomato plants are just about ready to head outdoors at the 6 week mark. Next, we add in the extra week for a total of 7 weeks. And then we count back from June 1st. For this example, the seeds should be started April 13th for a June 1st planting. Remember though to always check the recommended dates. Some vegetables really do take longer to germinate and grow. While other seeds germinate and grow extremely fast. Hot pepper seed varieties can take upwards of 8 to 10 weeks because of slower seed germination. But some cucumber varieties on the other hand can be ready in as little as 4 weeks. Now it’s time to do a little homework – and get ready to start those seeds with confidence! This Is My Garden is a garden website created by gardeners, publishing two articles every week, 52 weeks a year. This article may contain affiliate links. How To Grow Sugar Snap Peas & Snow Peas – The Perfect Spring Crop! 5 Fall Lawn Care Tips To Get Your Yard Looking Great! September 15, 2018 TIMG Comments Off on 5 Fall Lawn Care Tips To Get Your Yard Looking Great! 4 Secrets To Watering Vegetable Plants And Flowers! May 26, 2018 TIMG Comments Off on 4 Secrets To Watering Vegetable Plants And Flowers!